Create simple workflows by setting triggers for certain events and actions. The right action at the right time. 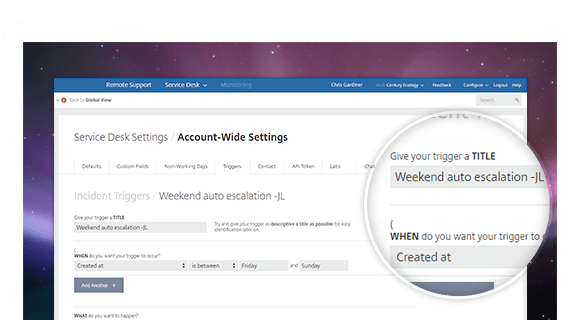 Triggers are very useful for people who need dynamic ticket routing within Service Desk. When a ticket comes into the queue, you can set triggers that flag it for special attention. These types of triggers can be established for all high-priority incidents so technicians can immediately take action. Choose what happens and when. There are two basic parts to a trigger: an event happens and an action follows. You pick the criteria from an extensive list to align Service Desk with the way your business works. Events include options like close due dates and new feature requests, while actions can anything from technician assigning to automatic comments. You can create triggers associated with specific customers, so if a very important person needs prompt support, you’ll be ready. Whenever the customer submits a new incident, asks a question or posts a reply, Service Desk can instantly take the first step, whatever you decide it should be. 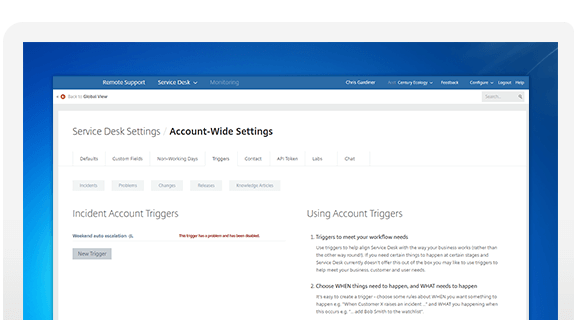 Service Desk offers triggers for any record or knowledge article, and they can apply on a per-service or account-wide basis. Account triggers occur first, followed by service triggers. Just keep in mind these actions do not cascade — triggers cannot trigger others.